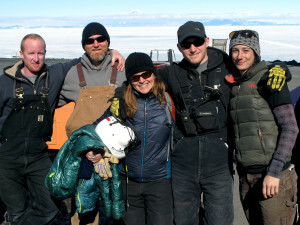 The RAID traverse team arrived at Minna Bluff on Saturday ahead of schedule. Hooray! 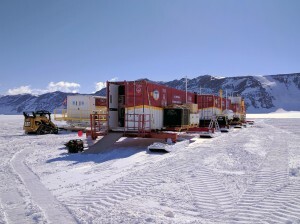 After making good time on the first part of the traverse, they safely passed across the second glacial shear zone on their route to the drill site. These are very treacherous zones where one faster glacial stream is shearing past another slower one, opening up crevasses that can be 10s or 100s of meters wide. Equipped with ground-penetrating radar on board the lead track vehicle to monitor conditions, they fortunately made it just fine with no major difficulties. It really paid of this year that the traverse leaders had wisely done a ‘recce’ of the route last season. The RAID modules at Minna Bluff. From front to back — shop, fluid recirculation, and generator modules, with drill and rod modules in the background. Very soon the drill mast and canopy will be up. So now the RAID equipment is being set up in its initial field drilling configuration at Minna Bluff. Before moving the modules into place the crew ran a track vehicle and blade over the area multiple times to smooth and compact the surface, then let it all sit overnight to sinter. ‘Overnight’ is, of course, a relative term, since the sun is above the horizon 24 hours a day, so even during the cooler period when the sun dips slightly there is ample warming of the surface. Now they have a firm base to work on as a drill pad. Camp manager Beth and the carpenters on their way out to Minna Bluff to set up our camp. 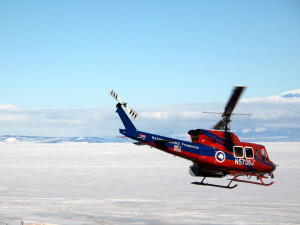 A crew of carpenters and our camp manager flew out by helo today to start setting up camp. The rest of us – 3 in the science team and 4 remaining drill crew – hope to fly out by December 2, and then we can get started in earnest. We’re all happy to follow news from the field and can’t wait to get out there ourselves. Helicopter launch with the carpenter crew headed out to Minna Bluff. 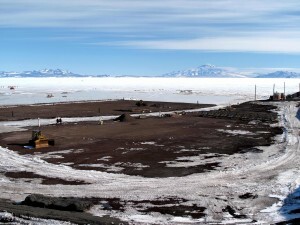 View from the ice pier, where the annual resupply vessel ties up, across McMurdo Sound toward Mt Discovery (R) and Black Island (L), with Minna Bluff just beyond.